U.K. Hospitals Are Overburdened, But The British Love Their Universal Health Care : Parallels Budgets are tight, wait times have grown and drugs are being rationed. But most of the U.K. believes the advantages of their taxpayer-funded coverage outweigh the frustrations. 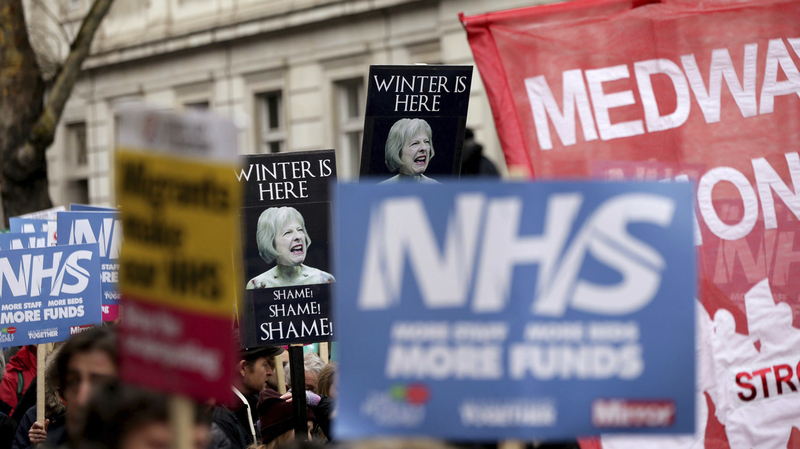 Protesters marched in London on Feb. 3 to demand more money for Britain's National Health Service, as winter conditions are thought to have put a severe strain on the system. When Erich McElroy takes the stage at comedy clubs in London, his routine includes a joke about the first time he went to see a doctor in Britain. 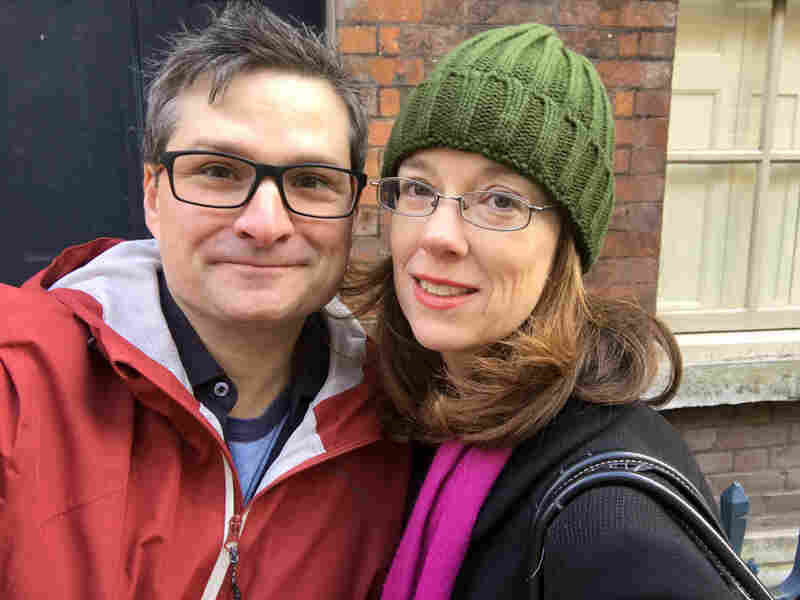 Originally from Seattle, McElroy, 45, has lived in London for almost 20 years. A stand-up comedian, he's made a career out of poking fun at the differences in the ways Americans versus Britons see the world — and one of the biggest differences is their outlook on health care. "I saw a doctor, who gave me a couple pills and sent me on my way. But I still hadn't really done any paperwork. I was like, 'This isn't right!' " McElroy says onstage, to giggles from the crowd. "So I went back to the same woman, and I said, 'What do I do now?' And she said, 'You go home!' "
The mostly British audience erupts into laughter. McElroy acknowledges it doesn't sound like much of a joke. He's just recounting his first experience at a U.K. public hospital. But Britons find it hilarious, he says, that an American would be searching for a cash register, trying to find how to pay for treatment at a doctor's office or hospital. It's a foreign concept here, McElroy explains. Onstage, McElroy recounts how, when the hospital receptionist instructed him to go home, he turned to her and exclaimed, "This is amazing!" Since the 2008 financial crisis, the U.K., like many countries, has been taking in less tax revenue — so it's had to cut spending. Its expenditure on the National Health Service has still grown, but at a slower pace than before. That means drugs are now being rationed. Tens of thousands of operations have been postponed this winter. Wait times at the emergency room are up, says Richard Murray, policy director at the King's Fund, a health care think tank. "If the ER is really busy, it makes the ambulances queue outside the front door — not great," Murray says. "And in some cases, the hospital is simply full." In recent months, there have been several "Save the NHS" marches across Britain, where thousands have demonstrated to demand improved care and more funding for the health system. One such march, on Feb. 3 on Downing Street in central London, caught President Trump's attention. Two days later, Trump tweeted that the NHS is "going broke and not working." He accused Democrats of pushing for a similar system of universal health care in the United States. "Dems want to greatly raise taxes for really bad and non-personal medical care. No thanks!" the president wrote on Twitter. That tweet offended many in Britain. It prompted Prime Minister Theresa May's office to issue a statement saying the U.K. premier is "proud" of her country's system. The U.K. health secretary, Jeremy Hunt, tweeted back at Trump, saying he may disagree with some of the claims of those attending "Save the NHS" marches, but that "not ONE of them wants to live in a system where 28m people have no cover" — a dig at the uninsured in America. Hunt wrote that he's proud that Britons "all get care no matter the size of their bank balance." The National Health Service spends less than half of what Americans spend per person on health care, and yet life expectancy is higher in Britain. Defense of the NHS runs straight across the British political spectrum. "You wouldn't find a single leading politician on either the left wing the Labour Party or the right wing in the Conservative Party that would talk about privatizing the NHS," Murray says. "That would be electoral poison." The NHS polls better than the queen. U.K. politician Nigel Lawson once said "the NHS is the closest thing the English people have to a religion." 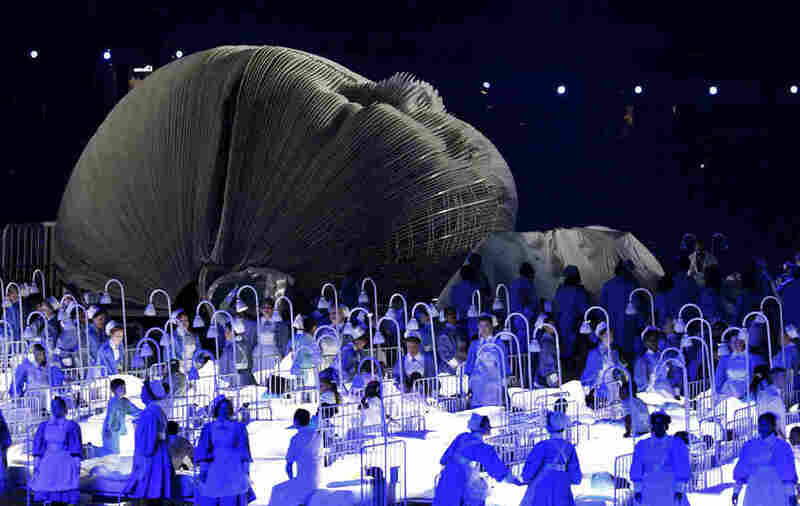 It featured prominently in the opening ceremony of the 2012 London Olympics, with doctors dancing to swing music and hospital beds arranged to spell out the letters N-H-S in aerial views from above. Britain's National Health Service celebrates its 70th birthday this summer. It was founded on July 5, 1948. After the pain of World War II, Britons decided to provide health care for all, and they're still very proud and protective of that choice, says Roberta Bivins, a historian of medicine at the University of Warwick. "People here are very, very uncomfortable that companies should profit from someone getting sick," she says. "In the U.S., we're much more comfortable with the idea that the market will provide services." Erich McElroy and his wife, Erin McGuigan, are both self-employed. McElroy, the comedian, says state-funded health care means his family doesn't have to worry about needing coverage through an employer. He and his wife Erin McGuigan are both self-employed. McGuigan works as a birth and postnatal doula, alongside NHS midwives. She gave birth to the couple's two children, in the NHS system, for free. "You get follow-up care, where the midwives and health visitors come to your home, for a number of days after you give birth, to do checks and ensure breastfeeding is established and [the] baby is well — just to get new parents on their way," McGuigan says. "I've had excellent care." She says she has had to wait four to six weeks for a doctor's appointment if it's not something urgent. McElroy says there is one thing he would like to change about the NHS. His comedy routine includes another joke about what happened after he had minor surgery in Britain. "The first thing they gave me when I came out of surgery was a fish pie — which I say in the routine, put me straight back into the hospital, because it was so disgusting!" he says. "They might give us health care," he jokes, "but the food is still terrible in this country."